Fall has officially arrived and we are happy about it. Warm clothes, brisk walks and a whole list of upcoming events happening (and Octoberfest for beer lovers!). Photo credit above: Kathy Jenkins. We are celebrating National I Love Yarn Day by giving away 8 skeins of Universal Yarn Deluxe Bulky for one lucky winner. A perfect yarn for the fall and winter season. 100% Superwash, the color is ice rustic. Knit or crochet in public, decorate your neighborhood or library with a yarn bombing or teach someone to knit, crochet or learn any yarn craft. October is National Bullying Prevention Awareness Month. Join Lion Brand Yarn in their #HatNotHate campaign. There are many ways in which you can become involved and include your community to end bullying. We will be hosting Lion Brand’s Hat Not Hate campaign at the Festival. In the meantime, see how you can get involved in the link above. 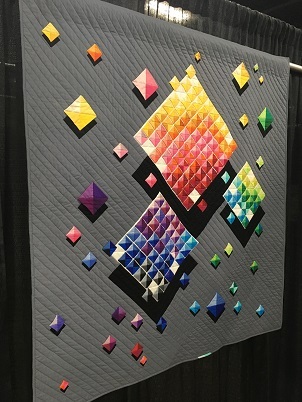 We attended the Pennsylvania National Quilt Extravaganza in Oaks, PA earlier this month and were amazed at all of the talent, including some pieces by our Pittsburgh Modern Quilt Guild members. Our favorite (shown below) is titled Levitation Fascination by Di Jobbins from Australia. It was fascinating! The Salvation Army Women’s Auxiliary is hosting their first Fall Sale. It is this Saturday, September 29th from 9:00 AM to 1:00 PM. See all details here. We are giving away 2 books to get you started on some holiday projects. See below for entry information. 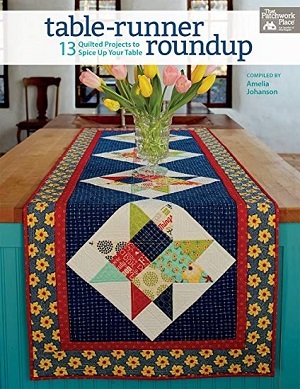 Table-Runner Roundup, 13 Quilted Projects to Spice Up Your Table, a Patchwork Place book, compiled by Amelia Johanson. “Grace the space in which you gather” from classic chic to a fresh farmhouse look, the versatility of a table runner is timeless. The designs shown in the book include scrappy stars, pineapples, savory olives and a clever hexagon runner that transforms into a place-mat. Fun and easy techniques from traditional patchwork to fusible applique’ to stitch and flip triangles and dimensional curves. 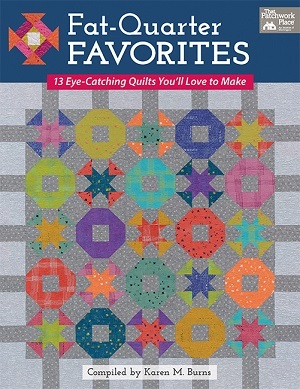 Fat-Quarter Favorites, 13 Eye Catching Quilts You’ll Love to Make, a Patchwork Place Book, compiled by Karen M. Burns. Fat Quarters are everybody’s favorite fabric cut. In this book you’ll find more ways to use those fabric pieces and create a new spin on some old classics: Jacob’s Ladder, Churn Dash and Pinwheel. A variety of techniques used include traditional piecing and fusible applique’ with today’s popular designers leading the way and sharing their ideas. Winners will be selected and announced in next newsletter.